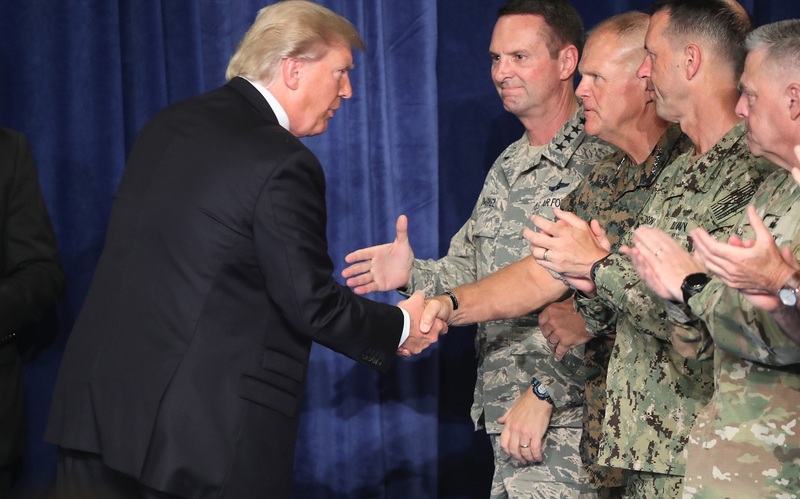 President Trump's long-awaited announcement on Afghanistan earlier this week probably told us more about the man himself than it did about his policy. This two-part series will look first at what it what the speech told us about Trump. Part two will look at the policy and its consequences for Australia. Trump began his speech by linking his war policy to domestic issues. Still under attack from critics from all sides after reigniting the controversy over Charlottesville with more divisive comments, the President made a plea to Americans to show the unity and purpose that Trump idealistically sees in the US armed forces, suggesting that the military should be a model for a more unified America. Trump was disciplined as he announced the new US policy for Afghanistan, and he stuck to his script. This discipline suggested we would see more of the influence of his Secretaries of State and Defense, his National Security Adviser and his new Chief of Staff, and perhaps we did. Trump said it was listening to his advisers that prompted him to deny his 'instinct' to pull out of Afghanistan, and he commented naively that things looked different once he was in the Oval Office. The President took charge of the policy, saying 'I directed...'. He said he had come to his decisions deliberately after much study and indicated resolve by saying that, while he had inherited the problem from his predecessors, he was not going to kick the can down the road. He even tied his announcement into his Saudi speech, where he had used particularly aggressive language. The influence of advisers is undoubtedly there in the newly announced policy, but only time will tell how much they can mitigate the President’s disruptive tendencies. The issue of what to do about America’s longest war has been running for quite some time in Washington. In June President Trump gave Defense Secretary Mattis the authority to deploy up to 3900 extra troops to Afghanistan but reports claim that Mattis refused, saying at the time that he would not deploy more troops until he had a strategy. If correct, that is influence. Also, since April, the Pentagon has refused to give details to the media about troop numbers and units deployed in Iraq and Syria for operational security reasons. Now a similar restriction will apply to Afghanistan. The US media will hate it. For Australians, this evokes memories of the 'on water operations' blackout logic that was used so successfully in Operation Sovereign Borders. It is a justifiable tactic, and the fact that Trump is now withholding such details in relation to Afghanistan as well as Iraq and Syria indicates that new hands are indeed now guiding policy. The question is: can they guide the President? The President set out 'core US interests', apparently to give a framework to his policy. He said he was going to seek an honourable and enduring outcome, due in part to sacrifices already made. He said he understood the consequences of a rapid exit would be predictable and bad, and that an uncontrolled Afghanistan posed immense security threats. Now, these are not really ‘interests’, core or otherwise, but perhaps they do represent objectives. A Mattis or a McMaster would see clarity of language as critical to guidance as it progresses down the command chain to those in the field. But for President Trump that might just be pedantry. There seemed to be a lot in the President’s speech, read from a teleprompter, that was very much Trump. So perhaps the President did not just take a speech prepared by his advisers, add a few notes in the margin and then read it out. It sounded as though he may have made the last substantial edit. It was reported that the President was enthusiastic about a proposal put forward by Eric Prince, a keen Trump supporter and the founder of the discredited Blackwater company, to hand the war in its entirety over to security contractors with the fantastic hope of saving up to $30 billion. Trump’s military advisers are said, quite rightly, to have hated the idea and there was no mention of it in the policy announcement. Security contractors might still be used, though under the new secrecy policy we will not know who is being deployed until we see them on the ground in Afghanistan. Even then, it is going to be difficult to know how widely contractors are being used. As long as security contractors remain tightly under national control, there is no reason why they should not be used. But Prince is unlikely to be the new Viceroy of Afghanistan. While President Trump’s announcement didn't specify how many more troops are to be deployed, an earlier leak put the number at 4000. A colleague with access in Washington was of the opinion that Trump’s advisers recommended in the order of 10,000 to 15,000. His view was that Trump stood firm against this and directed that the number be smaller, in the order of the 4000 figure leaked. It is going to be almost impossible to hide these numbers or their mission for long and, depending on confirmation of the figure, it may be an interesting indication of power relativities within the White House. Many still hope that a ‘Trump Administration’ will emerge from whatever is going on in Washington, rather than the US and the world being run by Trump and just a few advisers. Granted, a few advisers of the current variety might still be better than a world run by just President Trump, but we would all benefit if a complete Administration were to emerge. Some hope the Afghanistan announcement might be the start of a coherent Administration, given all the personnel changes that have recently occurred in the West Wing, but it appears that President Trump remains his own man on issues he believes in; he will not be pigeon-holed, and he is not going to be predictable. Such eccentricity could be tolerated as long as there are results, and in my next post I will look at the policy itself and what it might mean.